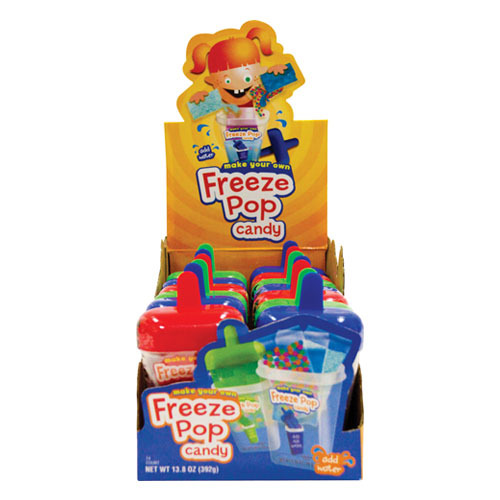 This is the freeze pop kits that kids will fall in love with. The kit contains three different types of candy: a candy powder, a candy gel and candy bits. 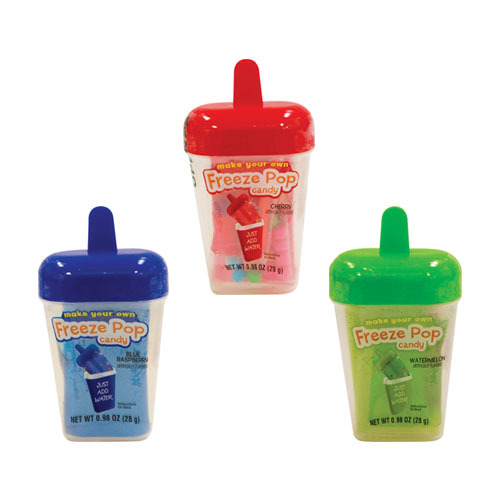 The candy can be eaten immediately or add water to the reusable ice pop mold for a delicious frozen treat offered in blue raspberry, cherry or watermelon. INGREDIENTS: DEXTROSE, CITRIC ACID, MALTODEXTRIN, MALIC ACID, ARTIFICIAL FLAVOR, ARTIFICAIL COLORS (BLUE 1, RED 40, YELLOW 5). INGREDIENTS: CORN SYRUP, WATER, CITRIC ACID, MALIC ACID, POTASSIUM SORBATE, SODIUM BENZOATE, ARTIFICIAL FLAVOR, ARTIFICAIL COLORS (BLUE 1, RED 40, YELLOW 5). INGREDIENTS: DEXTROSE, MALTODEXTRIN, MAGNESUIM STEARATE, CARNAUBA WAX, CONFECTIONER'S GLAZE, ARTIFICIAL FLAVOR, ARTIFICAIL COLORS (BLUE 1, RED 40, YELLOW 5).